The job description for this role basically is to coach, demonstrate and share lesson plans and development sessions with Teachers. 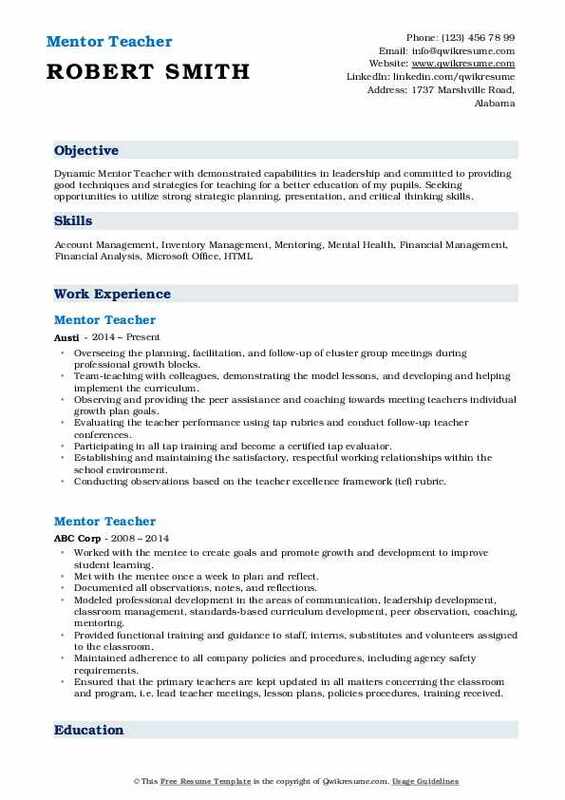 Additional duties mentioned on the Mentor Teacher Resume include – providing support, assisting management, analysing student needs, assisting teachers on how to assess and identify student’s performance level, assisting in framing and delivery of effective lesson plans, implementing best instructional practices, delivering professional development modules, and modifying instructional plans to suit the evolving needs of the student. 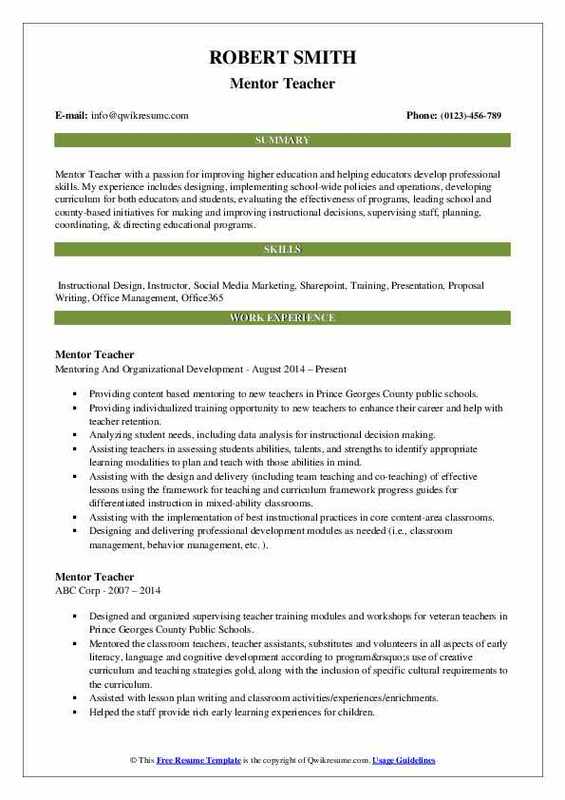 The qualifications listed here determine the success of a Mentor Teacher – demonstrable professional development expertise, proficiency in a teacher leadership role, and outstanding record of building instructional materials for staff and parents, human relations skills, ability to effectively utilize latest teaching technologies, and knowledge of PDLT and PEIP training. A Master’s degree with plenty of work experience is commonly seen in most of the successful resumes. Objective : Accomplished Mentor Teacher. Highly motivated to leverage two years of leadership, experience, and achievements to make an immediate impact on business operations. Proven self-starter who is highly effective at planning and aligning resources to meet short and long-term goals. Autonomously mentored and trained as a beginning teacher to ensure they were prepared to work successfully as an educator. Responsible for assisting the student teacher in the improvement of instruction through analysis of instructional teaching methods, identification and management of professional development opportunities, and follow-up and coaching strategies related to individual professional development plan goals. Handpicked by the supervisor to coach a student teacher due to previously demonstrated ability to excel. Transformed the student teacher to be the sole teacher of the classroom for eight straight weeks explicitly. Conducted continuous meetings to provide constructive feedback and encouraging the student teacher to be part of their own reflection process. Increased the instructional and professional performance of the student teacher from developing to accomplished by the end of the school year. Reviewed the classroom curriculum to be sure it reflects EEC, DOE, and NAEYC regulations and standards. Objective : Data-driven and results-oriented Mentor Teacher with a clear vision that encompasses scholars, staff, and stakeholders. Effectively communicates the highest leverage developmental goals and action steps for teachers that reflect high expectations for student learning and growth. Reflective and committed to ongoing personal and professional development while presenting an exemplary work ethic. Mentoring the teachers across a range of grades by providing them with timely and constructive feedback on classroom instruction. Designing and presenting professional development sessions for teaching staff on topics such as growth mindset. Creating professional learning community sessions on topics such as academic ownership and data analysis. Supporting teachers to use this data to plan interventions for students who are not on track. Collecting, analyzing and using the data to facilitate data meetings and create future professional development sessions for staff. Planning and presenting the team building activities that have boosted morale among over 30 teaching and support staff. 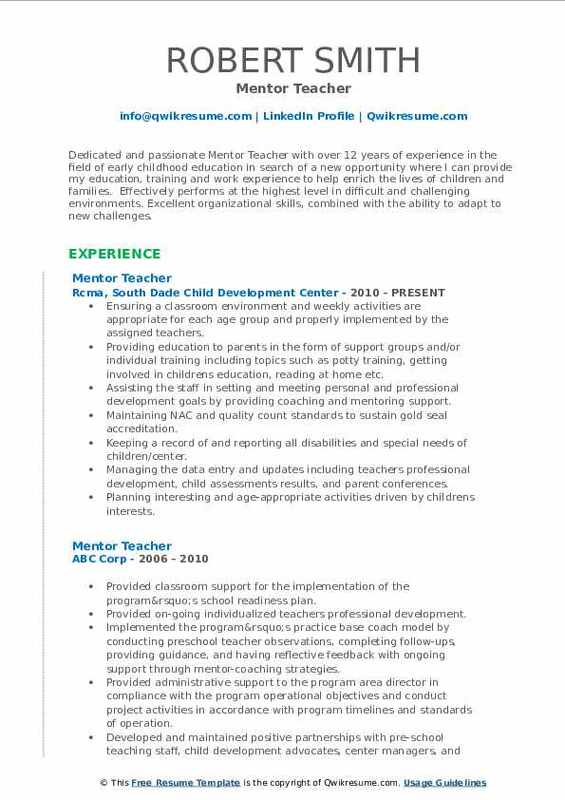 Supervising assigned center-based staff on a day to day basis to ensure compliance to head start performance standards and program requirements. Writing and conducting performance evaluations as assigned. 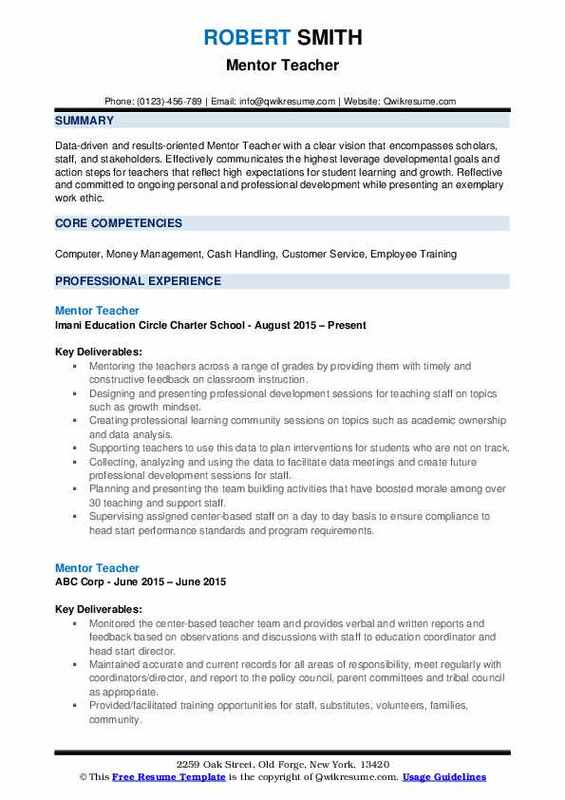 Summary : Mentor Teacher with a passion for improving higher education and helping educators develop professional skills. 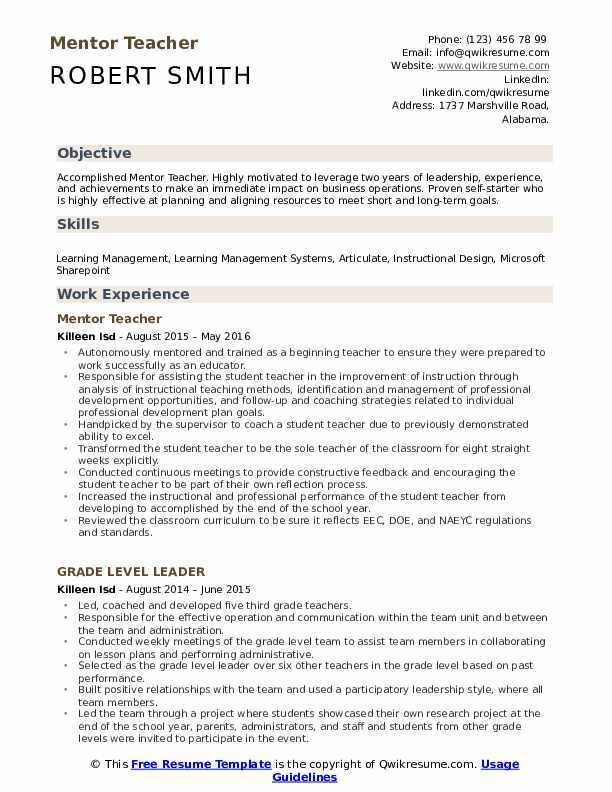 My experience includes designing, implementing school-wide policies and operations, developing curriculum for both educators and students, evaluating the effectiveness of programs, leading school and county-based initiatives for making and improving instructional decisions, supervising staff, planning, coordinating, & directing educational programs. 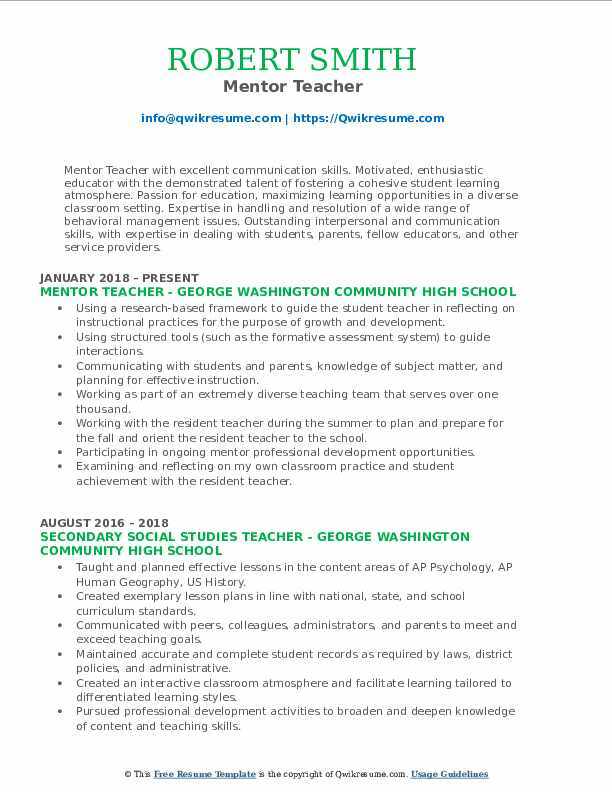 Providing content based mentoring to new teachers in Prince Georges County public schools. Providing individualized training opportunity to new teachers to enhance their career and help with teacher retention. Analyzing student needs, including data analysis for instructional decision making. Assisting teachers in assessing students abilities, talents, and strengths to identify appropriate learning modalities to plan and teach with those abilities in mind. Assisting with the design and delivery (including team teaching and co-teaching) of effective lessons using the framework for teaching and curriculum framework progress guides for differentiated instruction in mixed-ability classrooms. Assisting with the implementation of best instructional practices in core content-area classrooms. Designing and delivering professional development modules as needed (i.e., classroom management, behavior management, etc. ). Providing structured opportunities for peer coaching and reflection on lesson design, delivery, and assessment in order to appropriately adjust instructional practices to meet the evolving needs of the student. 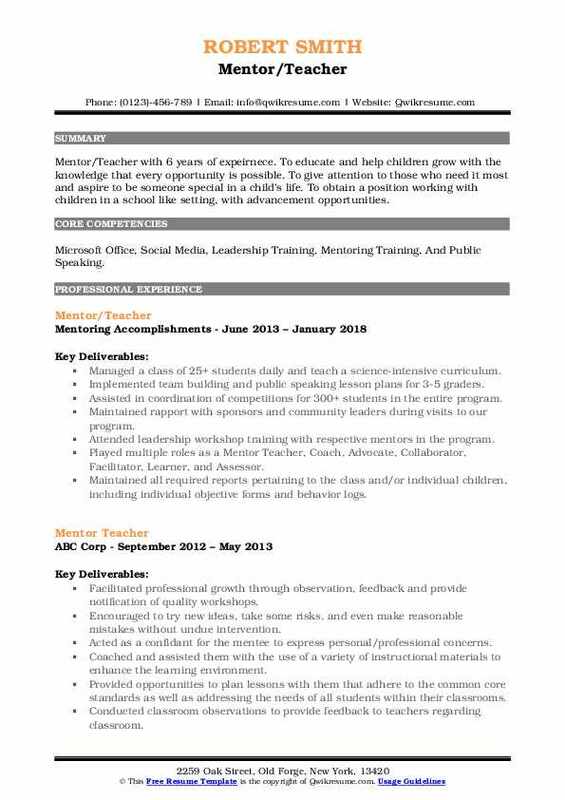 Summary : Dedicated and passionate Mentor Teacher with over 12 years of experience in the field of early childhood education in search of a new opportunity where I can provide my education, training and work experience to help enrich the lives of children and families. Effectively performs at the highest level in difficult and challenging environments. Excellent organizational skills, combined with the ability to adapt to new challenges. Ensuring a classroom environment and weekly activities are appropriate for each age group and properly implemented by the assigned teachers. Providing education to parents in the form of support groups and/or individual training including topics such as potty training, getting involved in children's education, reading at home etc. Assisting the staff in setting and meeting personal and professional development goals by providing coaching and mentoring support. Maintaining NAC and quality count standards to sustain gold seal accreditation. Keeping a record of and reporting all disabilities and special needs of children/center. Managing the data entry and updates including teachers professional development, child assessments results, and parent conferences. Planning interesting and age-appropriate activities driven by children's interests. Summary : Mentor Teacher to acquire an opportunity that would allow me to utilize my skills and expertise gained from mentoring, developing, presenting and facilitating workshops/ training, curriculum writing and event planning with a focus on the development of the cognitive and social-emotional identity for culturally diverse males at various life stages. I also offer over 12 years of consulting in these areas. Providing feedback on assignments, curriculum implemented, and interaction with children. Providing opportunities for student teachers to practice their skills. Ensuring that student teachers receive a positive experience in which they are able to learn. Developing student teachers through modeling of best practices using the standards-based curriculum. Submitting the recommendation to HR at the end of the year whether to rehire the teachers or not. Set up peer teaching/coaching opportunities for them with other teachers within their school. Assisting the teachers with best practice teaching techniques as well as classroom management strategies. Providing feedback to the staff regarding program development, mentor-resident relationship, and resident teacher progress. Summary : Dynamic Mentor Teacher with demonstrated capabilities in leadership and committed to providing good techniques and strategies for teaching for a better education of my pupils. Seeking opportunities to utilize strong strategic planning, presentation, and critical thinking skills. Overseeing the planning, facilitation, and follow-up of cluster group meetings during professional growth blocks. Team-teaching with colleagues, demonstrating the model lessons, and developing and helping implement the curriculum. Observing and providing the peer assistance and coaching towards meeting teachers individual growth plan goals. Evaluating the teacher performance using tap rubrics and conduct follow-up teacher conferences. Participating in all tap training and become a certified tap evaluator. Establishing and maintaining the satisfactory, respectful working relationships within the school environment. Conducting observations based on the teacher excellence framework (tef) rubric. 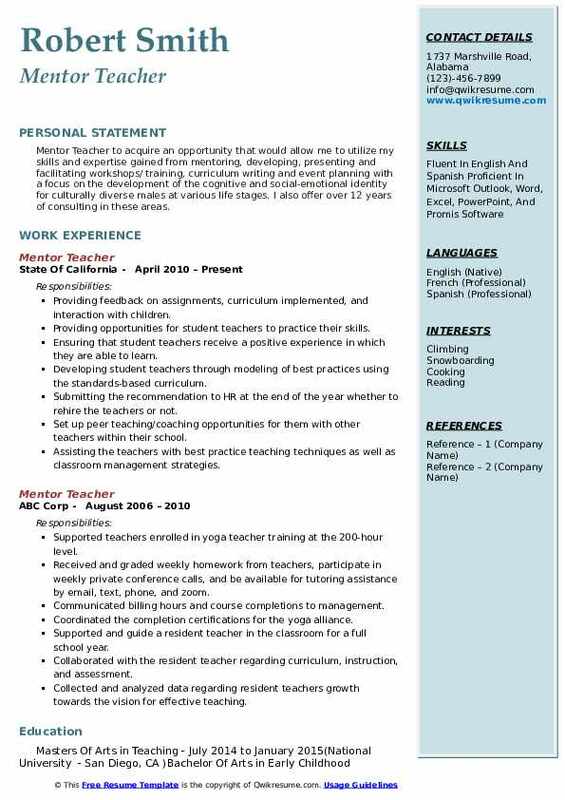 Objective : Mentor Teacher with excellent communication skills. Motivated, enthusiastic educator with the demonstrated talent of fostering a cohesive student learning atmosphere. Passion for education, maximizing learning opportunities in a diverse classroom setting. Expertise in handling and resolution of a wide range of behavioral management issues. Outstanding interpersonal and communication skills, with expertise in dealing with students, parents, fellow educators, and other service providers. Using a research-based framework to guide the student teacher in reflecting on instructional practices for the purpose of growth and development. Using structured tools (such as the formative assessment system) to guide interactions. Communicating with students and parents, knowledge of subject matter, and planning for effective instruction. Working as part of an extremely diverse teaching team that serves over one thousand. Working with the resident teacher during the summer to plan and prepare for the fall and orient the resident teacher to the school. Participating in ongoing mentor professional development opportunities. Examining and reflecting on my own classroom practice and student achievement with the resident teacher. Checking and providing feedback to the resident teachers' lesson plans weekly. 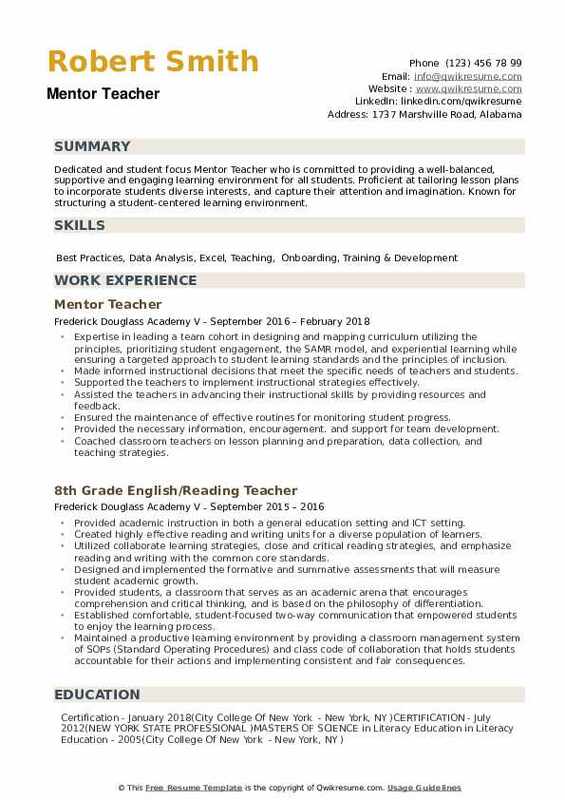 Headline : Mentor/Teacher with 6 years of expeirnece. To educate and help children grow with the knowledge that every opportunity is possible. To give attention to those who need it most and aspire to be someone special in a child's life. To obtain a position working with children in a school like setting, with advancement opportunities. Skills : Microsoft Office, Social Media, Leadership Training, Mentoring Training, And Public Speaking. Managed a class of 25+ students daily and teach a science-intensive curriculum. Implemented team building and public speaking lesson plans for 3-5 graders. Assisted in coordination of competitions for 300+ students in the entire program. Maintained rapport with sponsors and community leaders during visits to our program. Attended leadership workshop training with respective mentors in the program. Played multiple roles as a Mentor: Teacher, Coach, Advocate, Collaborator, Facilitator, Learner, and Assessor. Maintained all required reports pertaining to the class and/or individual children, including individual objective forms and behavior logs. Submitted a written lesson plan weekly to the early childhood coordinator for prior approval. Objective : An expert Mentor Teacher to all students from adult to 1st grade, skilled at adapting curriculum and concepts in ways that make learning accessible for all students. Planning, developing and providing professional development on a variety of topics including content and use of new district programs to facilitate classroom instruction and effectiveness. Led one-on-one meetings with a new teacher. Offered advice/suggestions for difficulties mentee was having. Observed in mentees classroom and provided feedback on classroom management, teaching strategies, etc. Kept online learning program, coordinating with students, parents, district, and my virtual academy company. Coordinated informal and formal evaluations with student teachers and university supervisors. Demonstrated that with accountability, students will meet the highest standards set. Showed evidence of adapting and differentiated instruction for all students and a classroom forum for holistic growth. Maintained complete and accurate records. Developed and maintained genuine, positive and consistent communication with parents. Contributed to and benefit from the campus community. 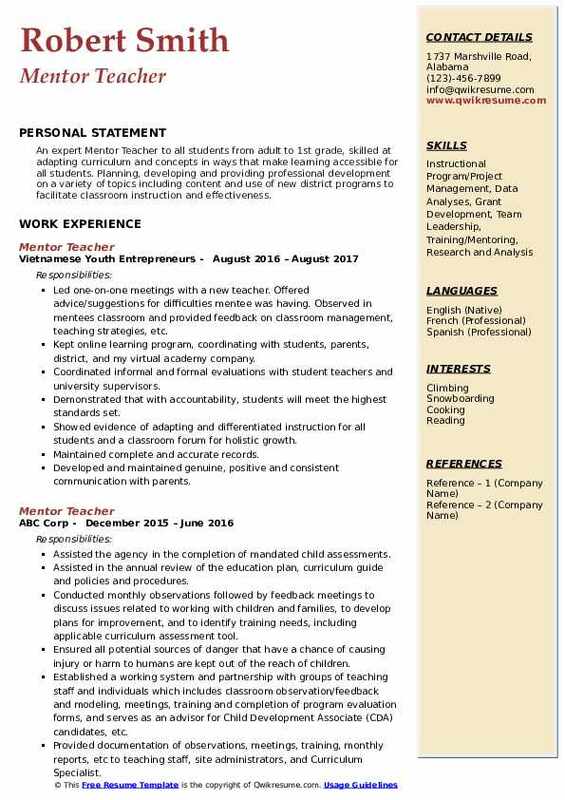 Objective : Dedicated and student focus Mentor Teacher who is committed to providing a well-balanced, supportive and engaging learning environment for all students. Proficient at tailoring lesson plans to incorporate students diverse interests, and capture their attention and imagination. Known for structuring a student-centered learning environment. Expertise in leading a team cohort in designing and mapping curriculum utilizing the principles, prioritizing student engagement, the SAMR model, and experiential learning while ensuring a targeted approach to student learning standards and the principles of inclusion. Made informed instructional decisions that meet the specific needs of teachers and students. Supported the teachers to implement instructional strategies effectively. Assisted the teachers in advancing their instructional skills by providing resources and feedback. Ensured the maintenance of effective routines for monitoring student progress. Provided the necessary information, encouragement. and support for team development. Coached classroom teachers on lesson planning and preparation, data collection, and teaching strategies. Brainstormed professional goals, needs, and strategies with classroom teachers using the collaborative process. Observed classroom teachers and provided feedback using notes and feedback forms.